Holy sh*t, is this real life?? You guys, I DID IT!! I finally had a 5-figure month in business!!! I feel like this is one of those milestones every business owner looks forward to, so it was totally surreal when it happened. Any guesses as to how I did it?? Yep, I made the bulk of my money this month from selling OTHER PEOPLE’S products. Let’s dig into the deets! *Please note that the links used below and throughout the article are affiliate links. This means that I will earn a small percentage of any sales made through those links, at no extra cost to you. Thank you for your support! How did I achieve my first ever 5-figure month?? To my surprise, it was actually by recommending other people’s products! At this point, I had been running The Unconventional RD Community for roughly a year, but hadn’t created any of my own products yet. However, I had been speaking at every iteration of the RD Entrepreneur Symposium since it started and would promote it to my Facebook group/email list as an affiliate. Affiliate income is a GREAT option for people who have built a community or following but have not yet created a product of their own. At this point, I had built up the Unconventional RD Facebook community to 2,836 people and my email list had just shy of 1,000 people on it (966, to be exact). However, my email list was cold, cold, COLD. The last email I had sent was 1 small teeny-weensy email 5 months ago promoting the Fall 2017 RD Entrepreneur Symposium. I was a little nervous to send out another promotional email without any communication in between, but hey, I just had to DO IT and then do better w. regular emails moving forward. The first time I promoted the symposium: I didn’t even have an email list to market to. I shared my affiliate link in a few Facebook groups and with some peers and ended up making $835 in affiliate income. At the time, this TOTALLY exceeded my expectations and I was PUMPED!! Based on that trajectory, I was hoping that mayyyyybe I could double my earnings again. I had hopes of earning $3,500 and my “reach goal” was $5k. By this time, my Facebook group had more than doubled and my email list had grown more than 6x. PS – I did this entire promotion while I was on vacation in Joshua Tree with my parents. Yay for the laptop lifestyle! I wrote the emails from a camp chair, using the wifi hotspot, scheduled them to go out and hoped for the best while we went for a hike, deep in the park with no reception. When we got back to the campground, I was thrilled to see that I had made 12 sales on the first day! Sales trickled in over the next few days, with a surge of 28 purchases right before the discount period ended, a few more full-price purchases after that, and an additional 6 sign-ups just hours before the cart closed. When I saw that I made $7,345 in affiliate income by the end of the sales period, I nearly fell out of my chair. Not only was this more money than I had ever made at one time, but it was also enough to slide me past the $10k/mo mark for the 1st time ever. Also (I swear, this was some divine intervention), it was nearly EXACTLY the amount I owed in federal income tax for 2017…. I honestly had been really really worried about how I was going to pay my taxes. I hadn’t been able to save enough throughout the year to pay my quarterly taxes and wasn’t really sure if I’d be able to pay the full amount in April or if I’d need to go on a payment plan. I had faith that the symposium sales would cover at least half of what I owed, but holy crap, I had no idea it would cover the whole thing!! I was SO FREAKING EXCITED!! So, although I earned more money than I ever had this month, most of it went to taxes. But that was A-OKAY. Paying off my taxes felt like a gigantic weight had been lifted and I had a clean slate to start saving for 2018. Phew! What about my other income sources for the month? Freelance writing was a pretty big success, bringing in $3,000. Since I had stopped accepting new private practice clients, my schedule was gradually becoming a lot more flexible and I was able to carve out more time for writing. I had also hired a few research assistants, so I was able to write more articles in a shorter amount of time. Even though I was paying out 25% of my writing income to assistants, I was still able to earn more money overall by doubling my productivity. The Functional Nutrition Library also brought in nearly $800, which was a really solid amount of monthly recurring income! I was excited to see that my hard work was starting to pay off. I mean, when I first started the library, I was honestly THRILLED at the thought of even $500 in monthly recurring income. So to surpass that already was a huge perk. And this was with NO advertising and NO marketing budget. Purely word of mouth. Since I was also freelance writing, seeing clients, and blogging, I was only spending 1 day per week updating the content and sending an email out about it to my list. That equates to ~$200/day, which really wasn’t bad in my book! Especially since I love writing and content creation 🙂 It truly doesn’t feel like work at all! 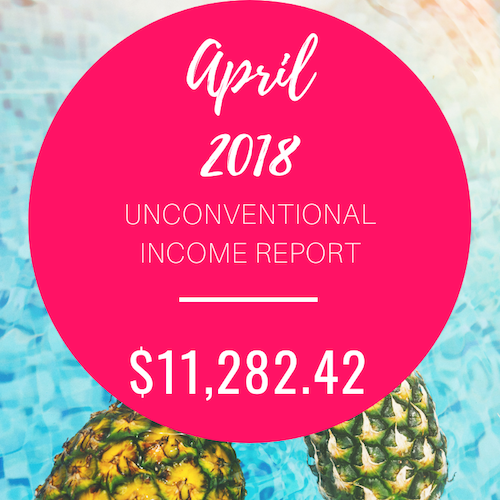 Plus, since this was passive income (a source of income that is scalable and doesn’t require trading my time for money), I knew that over time, the $$$ earned would continue to grow without requiring more of my direct attention. Oh yeah, I also hit 101 paying members!!! That was HUGE milestone for me 🙂 🙂 I had been hoping to hit at least 100 members in my first year and was able to achieve it in just 10 months. Yay! This month, my biggest expense was paying my research assistants, followed by payments to affiliates of the Functional Nutrition Library. However, both of these things are “good” expenses that actually earn me more money in the end. For example, without the help from my research assistants, I wouldn’t have been able to write as many freelance articles and would have earned less money. Similarly, with the FNL, sales made through my affiliates are sales that I may never have earned at all! So I am MORE than happy to reward them with a percentage of the sale. I opened a new ConvertKit account! ConvertKit is the email marketing service I use for this website. It’s designed for bloggers who have products or services to sell. It allows you to “tag” subscribers based on their behavior so that you can target them with customized emails that match the content they interact with on your website. I had been planning on launching a free blog to go along with the Functional Nutrition Library, so I signed up for a new ConvertKit account. Plans start at $29/mo for up to 1,000 subscribers and increase from there. While I LOVE ConvertKit, if you’re still dabbling in blogging or trying to find your online-business niche I think it’s totally fine to start with a free email service provider (my favorite is MailChimp, which is free up to 2,000 subscribers). Then, once you have a clear picture of how you plan to monetize your online business (check out this article for ideas), you can switch to something more robust like ConvertKit. Alright, that’s it for my best month (so far) in 2018! This site is great, my biggest question and more of a basic question is how did you start your business. Are you NYC based? If so, I feel like there are a lot of hoops I have to jump through to make my business into a legal LLC. How did you do this in general?